About six or seven miles west of Cardston along the No. 5 highway to Waterton Lakes is the little hamlet of Leavitt. It is nestled in a beautiful valley surrounded by rolling hills and backed by a skyline of rock mountains with Old Chief dominating the group. This valley was at one time called Buffalo Flats, although this was never an official title. Leavitt was named in honour of Thomas Rowell Leavitt Sr., one of the original pioneers and the ancestor of all the Leavitts in this area. When the first immigrants came to make their homes and settled in Alberta, all of the land west of Cardston and north of Lee Creek was out on a long-term lease to a large cattle rancher, and those who had staked their claims could not get them registered until the lease expired. On July 23, 1893 Francis Broadbent and his three sons, Charles, Levi and Hiram came to Buffalo Flats. Andrew Archibald had helped them find the surveyors stakes which marked the corners of each surveyed quarter section of land. Francis Broadbent chose the South West Quarter of Section 32 and his three sons the remaining quarter sections. They immediately left for Lethbridge to file their claim. After that, those who had previously chosen their land filed their claims at the land titles office in Lethbridge and were able to start building homes in Buffalo Flats. Some of the early pioneer families of the Leavitt area were: Archibald, Alder, Atkins, Baker, Broadbent, Brown, Bankhead, Coombs, Cooper, Cahoon, Glen, Hunt, Haslam, Hackett, Helberg, Leavitt, Layne, Matkin, Olsen, Quinton, Reid, Parks, Spence, Stewart, Stutz, Sibley, Sorenson, Smith, Thorpe, Vincent, Williams, Walburger, Wilson. As in the case with most Mormon communities, the church is the focal point of the spiritual and social activities of the people. A branch of the L.D.S. church was organized on May 24, 1895 with Frank Leavitt as Presiding Elder. Leavitt was the name then given to this branch of the Cardston Ward. The first meetings were held in the different homes. In the spring of 1896, ten teams went to the timber-Francis Broadbent, Charles F. Broadbent, William Cooper, Charles Quinton, Thomas R. Leavitt Jr., William Leavitt, Frank Leavitt, John Hunt, Horace Williams and Thomas Wilson. These ten outfits brought down enough rough lumber and logs to build a one- room church and school. The first meeting house was completed and dedicated on July 10, 1896. The following November 23, 1896 the Leavitt Ward was organized, and Frank Leavitt was chosen Bishop, a position which he held until 1908. The second Bishop of the Leavitt Ward was Willard G. Smith, who had taken a homestead in the Leavitt district in 1897. Under his leadership an addition was made to the one-room church. A large stage and a second storey with three classrooms and a hallway were added. This work was done by the community with Charles Quinton and Andrew Spence as carpenters and William Cooper as mason. In addition to their own building the members of the Leavitt Ward, along with all the other Wards in the Alberta Stake, were given an allotment toward the building of the Tabernacle in Cardston. This Tabernacle was completed in 1911. In November 1913 work commenced on the Alberta Temple, and again much donation and community work was done under the supervision of the Leavitt Bishopric. Bishop Smith was released November 1921. George Edward Cahoon was the bishop of the Leavitt Ward from November 1921 to March 1935. Work was still proceeding on the Alberta Temple, which was dedicated in 1923. He had the responsibility, as a leader of the Ward, to help with the completion of this project with the cash allotment and work still required. He had been the first recreational leader in Leavitt. The fourth bishop was Owen L. Archibald. He was bishop from March 1935 to January 1950. He was interested in the music of the ward. He played in an orchestra, lead the choir, took an active part in dramatics and concerts. Lervae A. Cahoon was the fifth bishop of the Leavitt Ward, followed by Ray Leavitt and Chester Walburger. As the scope of this history is from the beginning to 1950, their activities are not listed. There was no school held in Leavitt until the church house was built in 1896. The desks were made by the people who built the church. Three trustees were chosen. Frank Leavitt as chairman, William Leavitt and William Cooper as assistants. Clara Madden was the first school teacher. She came here as a young girl and made many friends wherever she went. She was an eastern girl, but married while in the west, making her home in Lethbridge. On June 8, 1896 school commenced. The district was not large and was very scattered. School started with an enrollment of 25 pupils from five to sixteen. The next three or four years saw an increase in enrollment to about 125 which made it necessary to hire another teacher. 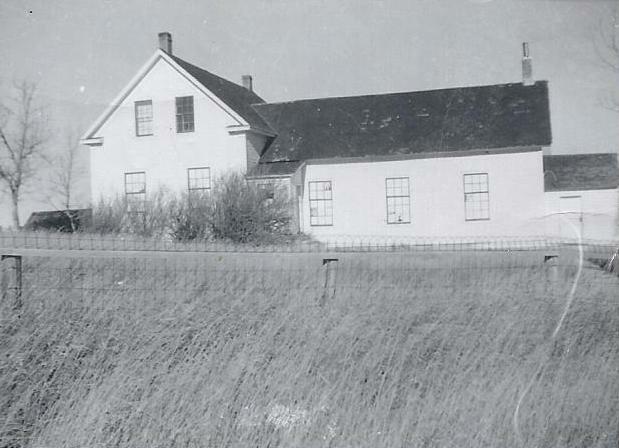 A new two-room school was built, which was destroyed by a fire in 1927. School was again held in the church house until the new school was built. Leavitt has the distinction of being among the first to be recognized by the Government as a School District and was given the number 458. At this time all the land in Beazer, Mountain View and Caldwell districts belonged to the Leavitt School District. In 1919 D. O. Wight, the principal of the school, organized a band which became known as the U.F.A. Band, as this was an election year. This band was invited to attend a young people’s convention in the University Building in Edmonton. There were thirty young people in this band. They played at many stations along the way to Edmonton, as well as performing in Edmonton. Leavitt gained much praise and recognition through this band. When the flood of 1902 washed the Cardston Cooperative Dairy down Lee Creek, the boiler, press and vat were saved. The Leavitt brothers bought and installed them in the log house Thomas R. Leavitt had vacated when he moved into his new brick one. Jake Workman, a brother-in-law, was the first cheese maker in this new dairy. Thomas R. Leavitt had erected a large two-storey log building and they installed a chopping machine in it, run by a large wind mill. He did custom chopping, taking his pay in toll, so much chop for his work. He bought hogs and raised them. The three brothers worked together. Frank ran the store, Thomas the feed lots, and William the dairy. Milk was sold in Cardston for 5 cents a gallon, the milkman received 1/2 cent per gallon for his pay, which netted him about $1.50. Some years later when a co-operative creamery was started in Cardston, John Bankhead drove the first cream wagon. When the farmers decided to use their milk and sell cream, it was impossible for this dairy to operate. In the early days of Leavitt there were roads to be built, bridges, homes, schools and church. Much of this work was community work. Many, many hours were spent working together helping each other build homes, and it would have been an insult to have offered a man a wage for community work. The tithing plan of the Church at this time required a large tithing granary and barn to be built. Charles Quinton had bought a quarter section of railroad land which he divided in town lots. These lots were sold to individuals who wished a lot on which to build a home closer to church and school. A lot was donated from William Leavitt’s quarter section for the church lot, one for the school and another for a tithing lot where this granary and barn were built. A lot for a town square was bought from Charles Quinton. When the tithing plan was changed, and people paid their tithing in cash, the tithing granary was sold to John L. Redford who moved it to his farm. With Bishop Cahoon in charge, it was decided to plow and remove the dirt from the town square to make a suitable ball diamond, and place to hold their out-of-door recreation. This took a lot of work by the people of the community. It has been improved over the years, and is one of the best in the district. When the two-room school was burned to the ground in 1927, through some unknown origin, blue prints were made for a new school. The people of the community were without a recreation hall. The bishopric and school trustees held a council meeting, and later a meeting was held with the ratepayers. It was agreed that a gymnasium be built for church recreation as well as school activities. The members donated their labour for this privilege. The Leavitt Irrigation project was another outstanding example of community co-operation. Rather than place mortgages on their properties to have an irrigation system built, the people organized work crews and did the work themselves with very little cash outlay, except for bridges, spillways, structures and equipment purchased. To accomplish this some 100 head of horses were used and from 50 to 60 men. Each man received ditch credit for the work done. This was credited to his land. There have been several fires in the area, which have destroyed homes and left families destitute. The people of the community immediately organized to build new homes, and help to supply the necessities for these families. For many years Annie Baker (Aunt Annie as she was affectionately known throughout the community) was mid-wife, nurse and doctor, travelling to Beazer, Mountain View, Caldwell and other places. Her nursing came first, and she was always willing to go when she was needed, regardless of the weather, or the time of day or night. Sometimes she would stay for two or three days until a mother and new baby were out of danger. There were no undertakers. The Relief Society and Bishopric took complete charge of caring for the bodies. There were others, which for lack of space cannot be mentioned, who were always willing to care for the sick, or help out in any emergency that might arise. During the flu epidemic in 1918 and in 1919, G. E. Cahoon, Sam Haslam and D. O. Wight, the three people in Leavitt who did not get the flu, went from house to house carrying water, chopping wood, doing chores, making mustard plasters, bringing medicine and fixing meals. The people of Leavitt have worked together and played together. Their dramatic club provided enjoyable entertainment, taking their three-act plays as far as Spring Coulee and Pincher Creek. There were always July Ist and July 24th celebrations, baseball games, basket ball games, dances, and family reunions. Today the people of Leavitt still work and play together. The beautiful chapel and cultural hall located just off the highway, built by hard work, sacrifice, love and co-operation, is the center of the religious and social activities of the community. Note: The Information in this article was taken from the Leavitt Ward History compiled by Emma L. Broadbent.